It could be a lifesaver. Everything you'll need to escape your vehicle quickly in case of a car accident: seatbelt cutter, retractable pin for popping airbags, steel hammer for breaking windows. Plus built-in compass, thermometer, whistle, high-beam flashlight and blinking emergency reflector light. Uses 4 button cell batteries (LR 44, also called AG 13, included). Imported. 6¼"l.
•Silver pointed knob is for breaking the windows. •Two small blue buttons on either side of the item; one is for turning on the blinking red hazard lights on the sides and the other turns on the LED light at the top of the item. •Compass on the bottom and a temperature gauge on the other side. Hurry! Quantities are limited! •Needle on the bottom is for popping an inflated airbag. •Emergency whistle on the bottom. 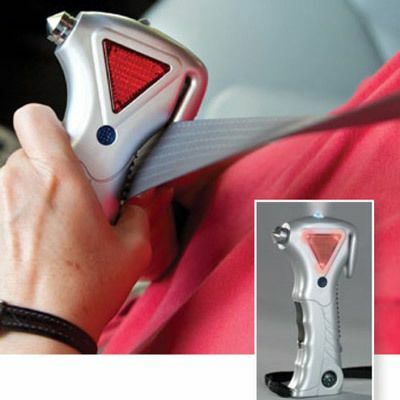 •An arm is on the side; this is used to cut the seat belt in case of an emergency. •Battery compartment door is located on the hand grip. "I bought for my twin teenage drivers, one for each car in case they ever needed it, for Christmas. Three days ago one of my children had an accident, with the car landing on the drivers side. The emergency breakaway tool was used to try to get out of the car using the hammer on the windshield....the one window that WILL NOT SHATTER when using the hammer - however it was used and will be placed in the next car. "